We bottled up deep-sea ingredients like Sea Kelp, Ocean Water and Sea Salt and infused them with ocean vibes so you can reef the benefits of super fresh, totally nourished skin. 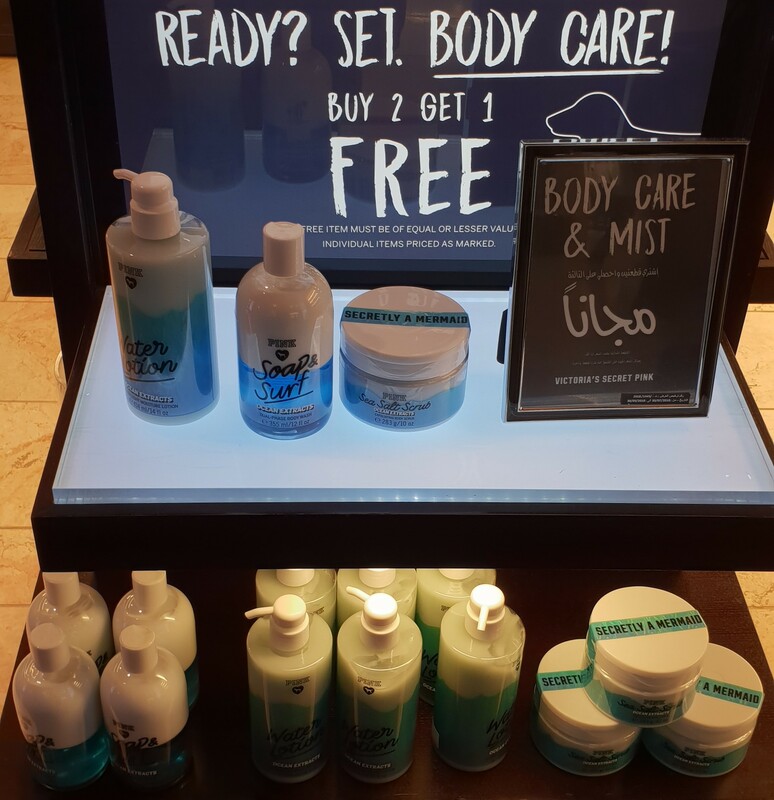 I was at Soug Sharq picking up a few birthday gifts (Farsali Unicorn Essence and Bath & Body Works Gift Set) and only passing by, when I spotted the Limited Edition Ocean Extracts Collection over at Victoria’s Secret. They had a “Buy 2 Get 1 Free” deal going on and I was so tempted to pick up a few things for myself, but refrained from doing so (… for now). I just took a few photos instead. The display is missing the Conditioning Lip Oil and Sea Mist. That said, it seems to me like this Ocean Extracts Collection is a perfect mash-up of both the Water Collection (here) and Sea-Tox Collection (here) from Bath & Body Works (here). The packaging is all lovely and blue! The feature ingredients are Sea Kelp, Ocean Water and Sea Salt. The moisturizer is legit called “Water Lotion“. It even says “Secretly a Mermaid” on the packaging of the Sea Salt Body Scrub! Proof that like I said, Bath & Body Works and Victoria’s Secret are sister companies.